Is it a sin to steal a Bible from a hotel room? This is the first in a series of articles about Hotel Etiquette, or less formally, the unwritten rules of staying in a hotel. There are many complimentary items supplied in hotels around the world including shampoos, soaps, fruits, tea bags and sewing kits. Many consumable items are widely accepted to be complimentary, but there are many other items that fall into a rather grey area. Surely the most controversial of all of these is the Bible. Thousands of hotels around the world supply a bible in the room, often supplied by the international Evangelic organisation The Gideons. While these Bibles are supplied free to encourage hotel guests to take interest in the Christian faith, what’s not clear is whether its OK to take one home with you. Every year thousands of hotel guests take a hotel Bible home with them, but are hotel Bibles really complimentary or are you committing a deadly sin by stealing this Holy Book? “The Gideons International place Bibles in hotel rooms all over the world, the aim being that the Bibles are placed there for successive visitors to read. These Bibles do have a contact number and if guests want to ask any questions regarding the Christian faith they are encouraged to contact The Gideons. If they do not have a personal copy of the Bible The Gideons are pleased to be able to help. So it seems that you’re not really supposed to take the Bibles home. Taking the Bible from the hotel isn’t really in keeping with the spirit in which The Gideons have supplied it, but if you have ever taken a bible from a hotel, try not to lose too much sleep over it. The Gideons themselves clearly aren’t calling it “stealing”, so you shouldn’t either. If however you take a strong liking the Bible in your room, either ask the hotel manager for permission, or as Caroline Cook says, the Gideons would be happy to supply you with your very own copy. All you need to do is ask! 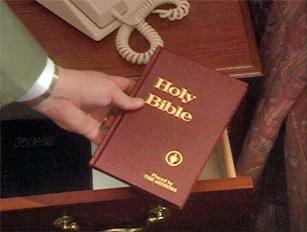 Ever taken a hotel Bible? Check in the next week for definitive full guide on what you can and can’t steal from a hotel room. I took two copies of the latest edition, as they were 100th anniversary editions. I collect books. I took a trilingual (German, French, English) New Testament Bible from a European hotel and I do NOT regret it. I think the divine will be quite busy with all the theft committed by bankers to worry about taking books!